Discover the market scene in France with AESU! The Côte d’Azur is well-known for its stunning beaches and luxurious casinos, but the real charm lies in the surrounding street market scene. Almost every morning, the coast comes to life with colorful flowers, tasty cheeses, and handmade goods. From locally-farmed vegetables to intricate antiques, discover the open-air markets in the south of France! There are more than film festivals in Cannes, France. The Forville Market is the most popular market in Cannes, although there are numerous others throughout the city. Locals and visitors alike shop at Forville for class French delicacies, from fresh raspberries to fried zucchini blossoms. Visitors meander down small, cobblestone streets in Aix-en-Provence, France. This small, picturesque city is filled to the brim with farmer’s markets, flower markets, and antique markets. Bring a tote bag, and fill it with fresh vegetables and vibrant textiles. 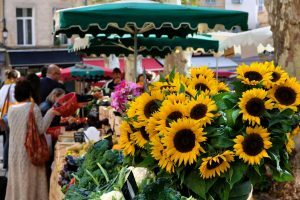 Aix-en-Provence offers the quintessential open-air market experience, as tourists can easily spend the entire morning pursuing the abundant selection. Famous for its red cliffs and clay quarries, the Roussillon is a must-see village in the French Riviera. Here, visitors can find a more intimate example of a classic French market. It’s only open on Thursdays, but people travel from far and wide to purchase soaps, linens, and local wine. Located on the Rhone River, Arles was once home to Vincent Van Gogh. There are two markets a week on the ring road, and vendors offer a variety of products. Try an olive, sample the wine, and taste the exquisite jams the city has to offer. While other markets might stick to traditional French fare, tourists can try international offerings from around the world. Avignon’s covered market is known as Les Halles, and it’s just a short walk from historic downtown. Tourists can peruse the multiple shops and vendors, then enjoy a bite at a bar or restaurant. Local chefs offer cooking demonstrations on Saturdays, and they even allow attendees to sample the dish at the end! This entry was posted on Wednesday, May 30th, 2018	at 10:21 am	. You can follow any responses to this entry through the RSS 2.0	feed. Both comments and pings are currently closed.